This scary-sounding recipe is a long time staple of mine, but don’t let the name fool you. This recipe is for anyone, anywhere, anytime. There isn’t a market in the world that doesn’t sell bread, bananas and peanut butter (or peanuts, in which case you can make your own!). It’s so simple and delicious that it deserves the Pulitzer Prize and at least one Grammy. This recipe is further proof that Express Eats don’t sacrifice on creativity or flavor. 1. Spread peanut butter onto each slice of bread. 2. Break banana in half and place each half down the middle of each slice. 3. Top with any optional ingredients. Roll up and scarf down. Other creative preparation methods can be found on the Original Peanut Butter Hot Dog post. Allrecipes.com accepted this recipe into their archives within days! You can view it here: Peanut Butter Hot Dogs. I love this!! I make mine like a sandwich for a meal. 2 toasted nutty whole wheat bread slices then cut banana in half ‘each way’ to fit 4 pieces perfectly on a slice of peanut buttered bread! YUM!! This may be the most fantastic hot dog I have ever seen…what an AWESOME way to make a PB and banana sandwich. Only a million times better. Whoa. Why didn’t I think of this? You know what it needs though? Some sort of relish/onion equivalent. Hmmm . . . pondering. I agree. Maybe a relish made from chocolate syrup with chopped peanuts and chocolate chunks in it! Not “scary” at all! Yummy! Well you she see the look on people’s faces when they inquire about what I’m eating and I tell them it’s a “peanut butter hot dog”. But I’m glad I have at least 1 supporter! Good idea for a snack. I like the cinnamon addition and jelly additions: very thoughtful. I do think it might work even better with a whole grain hot dog bun. My version is a workout food for high-intensity efforts. It’s a white flower tortilla and a ripe banana with 3:1 honey and nutella added for some multi-channel sugar uptake advantages. The idea is to maximize glycemic index of the food and avoid GI issues that can arise with whole grains at threshold/anaerobic effort levels. Also, it can be folded like a burrito and packed into foil for portability in a bike jersey. It works great on a hot dog bun, but bread is usually easier (and cheaper). Your tortilla + banana + honey and nutella creation sounds great but still needs a shot of some peanut butter! Just don’t take a spill while carrying that along, that would make quite a mess! A mess? I’m thinking more along a lines of “a nice cushion.” We’ve had a few broken bodies on the MTB trail rides lately. My road pace is high enough that if you think “autobahn,” you’ll get the right visual! I dodged a 38 mph group pile-up during the sprint finish of a race last year… yikes. I make these for my son ALL the time! We just call it a “banana dog”…sometimes i add sliced strawberries. another one he loves is peanut butter, fluff, bananas and strawberries…so good! Sliced strawberries sounds perfect! When I have kids, this is definitely going to be lunch every day! Haha. Hot days = bananas? Any reason for that? Yum this looks delicious. So easy and I could totally make it in my dorm! Absolutely! I wish I had thought of it when I was still in school! Mmmm, that’s a good idea, that bread is quite delicious. This is great using a whole wheat tortilla too in place of the bread. Just a little less messy! Great for kids! 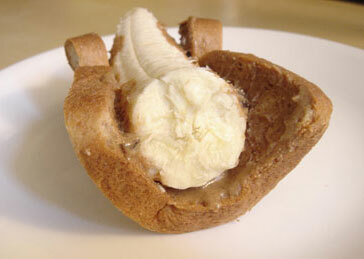 Almost anything tastes great with banana and peanut butter. But I still think mayo or salad dressing best suits your pnut butter hotdog as a spresd on any kind of bread or roll.